Northern England or the North of England, also known as the North Country or simply the North, is the northern part of England. 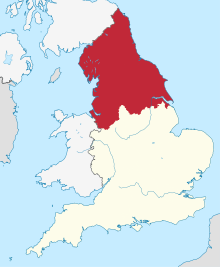 People have different ideas about which parts of England are in Northern England, but it usually includes the counties of Cheshire, Cumbria, County Durham, Lancashire, Northumberland, Westmorland and Yorkshire, as well as parts of Lincolnshire. There are big cities in Northern England, but there are also large mountains and lakes. The biggest Northern cities are Leeds, Liverpool, Manchester, Newcastle-upon-Tyne and Sheffield. Northern England has a long history: it was where many battles between England and Scotland were fought, and it was the place where the Industrial Revolution began. Nowadays, most of the industry is gone and Northern England is poorer than Southern England. However, Northern England still has its own culture and way of speaking, and many Northerners are proud of the region. The area roughly spans from the River Trent to the Scottish border in the north. However, people disagree about where the southern border is. Some people say Northern England starts near Birmingham, while some people say it only starts at the River Tees. The government says that Northern England is made up of three statistical regions: the North East, North West and Yorkshire and the Humber. These have a combined population of around 14.9 million as of the 2011 Census and an area of 37,331 km2 (14,414 sq mi). Northern England contains much of England's national parkland but also has large areas of urbanization, including the conurbations of Greater Manchester, Merseyside, Teesside, Tyneside, Wearside, South and West Yorkshire. ↑ Compton, Garnett (21 March 2013). "2011 Census: Population Estimates by five-year age bands, and Household Estimates, for Local Authorities in the United Kingdom". Office of National Statistics. Retrieved 15 May 2017. This page was last changed on 1 September 2017, at 10:28.